Remember QR codes? They flopped miserably because by the time users downloaded the app, opened the app and scanned the code, they could’ve typed the website in their smartphone’s browser. The lack of efficiency followed by the quick adaption of voice search rendered QR codes downright archaic rather quickly – except that Amazon has resurrected them! The difference now is the camera is the app, so there’s one less step. I tried it and I have to say, it was pretty easy. It’s way too early to tell if it will be a raging success for Amazon or whether it will quietly fizzle out. Why Should you care? If you have an e-commerce business or have tickets to sell, something like this might be in your future. 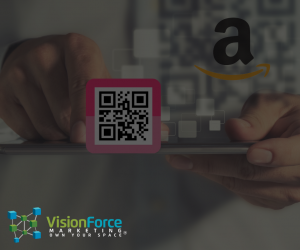 Of course, the marketing genius for Amazon is making something old, new again AND branded with their trademark smile as part of the code – it isn’t simply a pink QR code. The outcome will be interesting to watch in terms of consumer behavior.